I looked at Twitter Places this week to figure out how journalists could use it. Unlike Gowalla and Foursquare, Twitter doesn’t check someone into a location, but ties their tweets to a specific location. This means that Twitter’s check in service plays a much different role in the way it can be used in reporting. Unlike Foursquare, which awards a mayor title to anyone with the most visits to a location, Twitter only groups tweets together when they are searched by location. This means that you won’t really be able to find someone who frequents a particular location, but you can find out who was in the area when something happened if they tweeted about it. This means that Twitter isn’t good for tasks like finding popular opinion on a specific restaurant, but you can find out who was on Twitter when a fire happened nearby and ask them what they saw. There are a lot of third-party websites like trendsmap.com that map out current trends and allow users to search tweets by location. Originally the Twitter location service gave exact latitude and longitude for locations when given with a cellphone, but now the service only reports city or regional data. Many of my tweets happen in Arlington or Washington, DC but you can’t see where the tweets originate from specifically. This is why Twitter can’t be used for specific locations like Foursquare. It’s not always a good idea to tweet out your location, but you can use it to make sure your readers know where you are. Reporters following a national story like a disaster, a campaign tour, a sporting event or an awards ceremony can tweet with their location to prove that they’re actually in the same area as the thing they are reporting about. I tweeted out two locations over the weekend to show how the service works. I sent this tweet after I was told about a nearby restaurant. 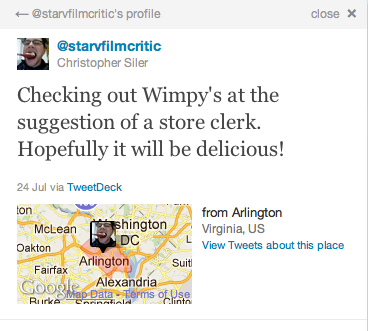 Twitter doesn’t give my specific location, so people will need to search for Wimpy’s in Arlington to find out what I am talking about. This isn’t useful if you want to find Wimpy’s, but someone looking to talk to someone about Wimpy’s and their food could easily find me using the location services in the advanced search. 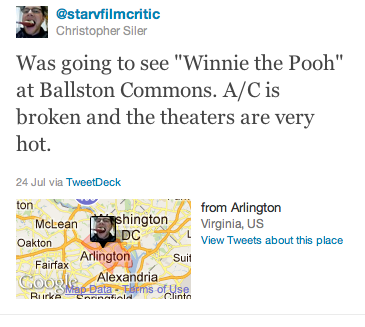 I had planned to see the new Winnie the Pooh movie with my fiancée, but we found out that the theater’s a/c was broken and the temperature inside was well over 100 degrees Farenheit. I wasn’t about to sit in an oven to watch a movie when we were going specifically to avoid the heat, so I decided to send out a tweet to anyone that might be watching. Twitter location allows users to find people based on their commentary in an area. This can be a powerful resource when looking to see what people think. Foursquare may provide more specific locations, but the check-ins don’t provide information on how people feel about the places they check into. You can infer that someone likes a place if they visit often, but not much past that. Twitter allows you to search by location and properly formatted searches could find some tweets that offer opinions as well as locations.